Nicole Byrd has been an Anglophile since she discovered the Dr. Dolittle books at about the age of seven. After enduring serious frustration when she could not learn to talk to the animals, she stuck to reading and devoured the Mary Poppins series, the Borrowers, and anything else English she could find, enjoying, as she grew, many British writers including the wonderful Jane Austen and even the Bard himself. And somewhere along the way, the writing bug bit, as well. An army brat, she has lived in Tennessee, Texas, Georgia, Kentucky, the Mississippi Gulf Coast, southern California, Britain, and Germany. Growing up, she changed schools ten times in twelve years. She has a BA and MA in English Lit and taught in the class room before stopping to write full time. She loves history, most of all English history, and most wanted to write historical adventure. So after publishing over thirty books in various genres, she was thrilled to write books set in the English Regency period–Jane Austen’s era. 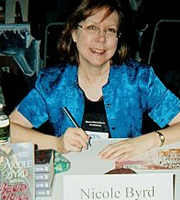 The first Nicole Byrd books were written with her daughter Michelle. When Michelle became too busy with a growing family to do more than function as the world’s best critique partner, the later books were written on her own. The books in the Sinclair Family Saga have been a delight to write, and the characters have become as familiar and beloved as old friends. The first book in the popular and award winning Sinclair family saga! There’s only one way for Miss Psyche Hill to gain control of her inheritance: marriage.